Bristol University Press talks to Henry Tam, a leading expert on the threats against democracy and what should be done to counter them. In addition to his academic work as a political theorist, he was in charge of the Labour government’s policies for civil renewal and community empowerment in the 2000s. Henry’s new book Whose Government Is It? is out today. 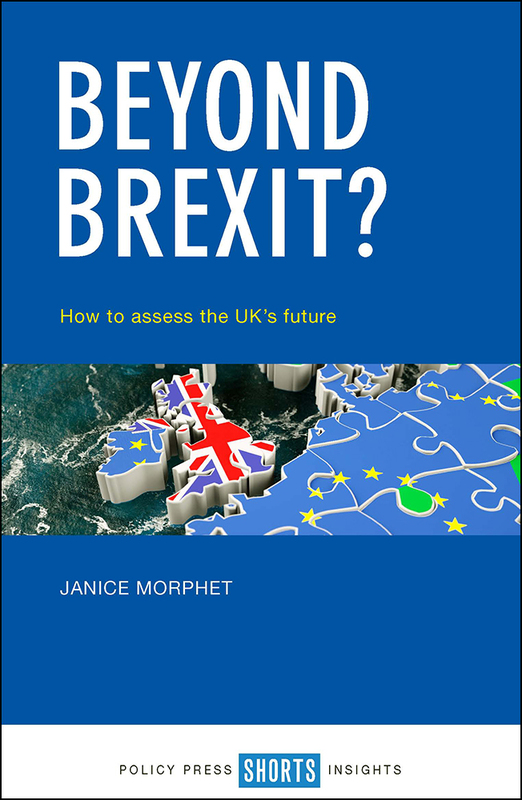 BUP: More and more we hear that leaving people to vote with little understanding of the key issues is a recipe for disasters. Brexit, Trump, the resurgence of the far right – how worried should we be? HT: There is something rotten indeed with the state of our democracy. Instead of ensuring people’s informed views and concerns are taken into account by those who govern on their behalf, democracy has been subverted by the use of private wealth and large-scale deception to skew political decisions. If we allow it to continue, we will keep sliding ever closer towards arbitrary rule. BUP: But isn’t it true that most people are not interested in politics and they don’t want to be involved with the business of government? HT: People are not interested in petty party-political squabbles, but very few can be indifferent about how their lives are affected by what those with ruling power may or may not do. For the last 50 years, around a third or more of adults in the UK and the US have not bothered to vote in elections, because they believed it would not make any difference. Among those who vote, an increasing number are unsure if they can trust politicians, while there is an alarming trend over the last decade with people supporting demagogues who want to impose solutions and do away with public accountability. We have seen those siding with the radical right winning support in elections and referendums across Europe and America. And they will use and abuse the power they get to advance their own agenda regardless of the harm it brings to others. BUP: So what can be done? Are we to stop people voting for certain groups or policies, and wouldn’t that be anti-democratic itself? HT: Democracy is not the same as letting people do whatever they want. It is a system for enabling people to cooperate in reaching informed decisions about what should be done collectively for their common good. As long as we allow democracy to be stripped of its true meaning, we leave the door wide open for it to be subverted. ♦ Public Accountability: To debunk the deregulation mantra and ensure people with power over others are held to account for their actions. BUP: In the meantime, what can people do in the absence of your proposed reforms? HT: As we press for these reforms, we should in parallel adopt arrangements and practices, which are known to facilitate cooperative working between state institutions and citizens, improve people’s quality of life, and raise satisfaction with public actions. In my latest book, Whose Government is it?, I brought together a group of experts who have extensively examined, developed, and implemented participatory and empowerment processes to explain how to establish them in practice. Their contributions to the book provide the reasons and guidance for developing the capacity for effective democratic engagement, and setting up the appropriate arrangements to sustain informed cooperation. BUP: What do you say to people who insist that we cannot afford to spend precious time and resources on consulting the public when it is not only costly, but could land us with damaging decisions? HT: The truth is that we can’t afford to let the gap between citizens and their government widen any further. Token consultation and corrupted participatory practices are of course worse than useless, but that’s precisely why we must focus on getting the necessary framework and suitable approaches in place. Democracy has the greatest potential, if we work on it, to advance the common good, safeguard personal well-being, and improve efficiencies. But neglected, its subversion will plunge countless citizens into insecurity and exploitation. Whose Government Is It? by Henry Tam is available on the Bristol University Press website. Order here for £19.99. Policy Press newsletter subscribers receive a 35% discount – sign up here. Please note that only one discount code can be used at a time. Russell Foster, Co-Editor of Global Discourse: EUrope Special Edition. This post was first published on the Global Discourse blog and can be viewed here. ‘EUrope’ is changing. In the most visible way this change has recently manifested itself in a drawn-out Brexit which will satisfy no-one, the rise of Euroscepticism and illiberal democracies in response to immigration and integration failures, a potentially resurgent eurozone crisis and continuing economic disparities across the EU, and mounting perceptions of a democratic deficit and the (il)legitimacy of EU institutions. These raise many difficult questions, the hardest of which is – can the EU survive? Our special edition “The Limits of EUrope” examines the challenges to the EU, and explores possible causes, and theories, of European disintegration. EUrope is changing rapidly – still struggling to respond to the aftershocks of the last few years while facing imminent challenges for the new European Parliament. The next European Commission will inherit an EU racked with political, economic, social, and institutional difficulties, with European populations strongly divided between those who see the Union as their best defence and those whose understandable anger and sense of abandonment are projected onto the EU. This journal brings together some of the leading scholars of EU studies, as well as experts from policymaking, civil advocacy, and industry, to investigate the serious challenges facing EUrope. For the first time, the post-war promise of democratic, peaceful, prosperous and open political union is not merely threatened, but is perhaps the cause of its own reversal. Free movement, free trade, and a pooling of sovereignty – the dreams of the ECSC’s and EEC’s creators – are not merely a reality; they are a reality which threatens to bring the entire European project crashing down. Popular consensus holds that mass Euroscepticism was defeated in 2017. But as current events across the EU demonstrate, the root causes of mass dissatisfaction have not gone away. The challenges which have faced EUrope since 2008 have neither been resolved nor disappeared of their own accord, and are likely to return in the future along with new challenges resulting from Brexit, a weaker German government, Macron’s tumbling approval ratings, and a right-wing surge from Andalusia to Saxony. These challenges necessitate new academic models of Europeanisation, de-Europeanisation, and EUrope itself. This interdisciplinary, international special edition, which draws together a diverse mixture of opinions, beliefs, backgrounds and specialisms, is a first step towards understanding how EUrope’s successes may be the cause of EUrope’s failures. It is now abundantly clear that EUrope will not be the universal political, economic and social model anticipated in the heyday of integration and expansion, and that while EUrope is unlikely to fragment or shatter as was widely predicted during the heights of the Eurozone and Migration crises, future EUrope will be very unpredictable. A new Parliament, a new Commission, the approaching end of the Merkel and Macron administrations, and the unforeseeable aftermath of Brexit – all of these will have major impacts on EUrope. What will be the future of EUrope? This journal offers some of the earliest thoughts. Simon Wren-Lewis, author of The Lies We Were Told, out today, talks about his anger at austerity and how this and other key events of recent times have been impacted by media bias and lies. “Many of the key events of the last eight years have a common thread to them. In the case of austerity, the Eurozone crisis, the 2015 UK election, the Brexit vote in the UK and Trump’s election, the media played a critical role in making them happen. This involved ignoring expertise, ignoring facts that didn’t fit the chosen narrative of one side, or simple lies. None of these events are mistakes only in hindsight, but rather errors that were predicted at the time. Documenting that is an important part of this book. It was for that reason that I tell the story through my blog posts at the time, with additional postscripts, preambles and introductions that enable each chapter to tell a complete story. There seemed no better way of showing how all of these policy or electoral errors were understood at the time and therefore could easily have been avoided. I began writing my blog mainlymacro because of my anger at austerity, and the fact that the view of the majority of macroeconomists that it was a bad idea was largely ignored by the media. When the media did talk to economists, they tended to be from the financial sector. Financial sector economists are biased in two directions: they tend to be right wing and they tend to talk up the importance of a capricious financial market and their ability to know its ‘needs’. I used the term ‘mediamacro’ to describe how most of the media seemed happy to tell the story of the deficit as if the government was a household, which any first year undergraduate textbook explains is not true. Many used the Eurozone crisis as an excuse for austerity, but I quickly discovered that the line most journalists took was missing the key reason for that crisis. Eurozone countries cannot create their own currency, and the institution that could act as an unlimited lender of last resort to individual governments, the European Central Bank, was refusing to do so. The crisis ended when the Eurozone changed this policy and became a lender of last resort to most countries. The exception was Greece, and I tell their more complex but shocking story in a few posts. Before the UK’s 2015 election the Conservatives talked about a strong economy, and talked up rising employment levels. The media went along with this narrative. In reality the recovery from the recession had been the weakest for centuries, in good part because of the policy mistake of immediate austerity. Strong employment growth combined with weak output growth meant productivity was stagnant, which in turn helped create falling real wages. Yet for mediamacro the government’s deficit was a more important goal of policy than economic growth or real wage growth, and as a result the economy was the Conservatives strong card that led them to victory at the election. Adapting an old Sun headline, I argued it was mediamacro wot won it, although luck also played its part. Defeat in 2015 led to Jeremy Corbyn being elected as leader of the Labour party. Although this took the commentariat by surprise, I argued it was the logical result of Labour’s weak or non-existent stand against austerity and a lot of what austerity required. When John McDonnell became shadow Chancellor, he invited me to be part of an Economic Advisory Council, and I explain how this led me to help create Labour’s fiscal rule, which is the first such rule that prevents austerity. I also explain why the Council came to an end. A consequence of the Conservatives winning in 2015 was a referendum on Brexit. A few months before I wrote a post reproduced in the book which fairly accurately set out how the campaign would play out. Remain’s case was that leaving the EU would have serious economic consequences, and it was a very strong case, but I suggested the media would balance this case against nonsense from Leavers, and the electorate could convince themselves that the economics was not clear cut. The fact that free movement prevented controlling immigration from the EU was by contrast clear cut, but as the government had played up the negative aspects of immigration they could not credibly change course. The book also has a chapter on the role of economists in influencing policy. Did the global financial crisis or the failures of macroeconomic forecasting discredit economics, and is macroeconomics influenced by ideology? I explain why the delegation of economic decisions can be partly about transparency, and why economics is most like medicine among the sciences. While the media played an important role in Trump becoming President and Brexit it does not explain why those things are happening now rather than ten or twenty years ago. The final chapter in the book looks at what neoliberalism is, and why both austerity and using fear of immigration to gain votes despite austerity can be seen as neoliberal overreach, by which I mean taking deception of the electorate in order to pursue ideological goals to a dangerous extreme. Both austerity and anti-immigration feeling helped the cause of Brexit and helped elect Trump. The Global Financial Crisis required a strong and quick recovery to avoid the dangers of populism. Austerity prevented a strong recovery, and it was undertaken as a cynical attempt to reduce the size of the state. The subsequent populist mood was directed towards the right by politicians and the media playing on racism and xenophobic fears. This was fertile ground for disasters like Brexit and Trump to happen. This suggests that even if we could go back to the world as it was before Brexit and Trump that is not enough to stop similar disasters happening again. The Lies We Were Told by Simon Wren-Lewis is available with 20% discount on the Policy Press website. Order here for £11.99. The views and opinions expressed on this blog site are solely those of the original blog post authors and other contributors. These views and opinions do not necessarily represent those of the Bristol University Press and Policy Press and/or any/all contributors to this site. 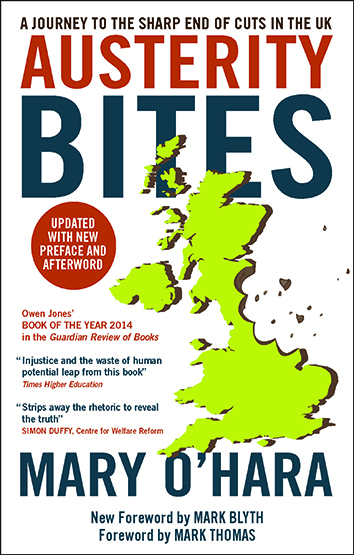 It’s four years since the hardback version of my book Austerity Bites: A Journey to the Sharp End of Cuts in the UK was first published. Borne from a year of travels around the country interviewing people about the impact of an unprecedented slashing of the welfare state, its task to was to unpick the multitude of harms to individuals, communities and society as a whole as a result. In many ways, with the Brexit fiasco so dominant over the past couple of years, it feels like a lifetime ago that austerity was the primary catastrophe facing the country. And yet, objectively, this is far from the case. Austerity is alive and kicking. Austerity was never about a short, sharp adjustment to the economy as its Tory advocates propagated in the wake of the 2008/09 financial crisis. It was always – and remains – a strategic manoeuvre to shrink the state and to hell with the consequences of those cuts for the real people on the receiving end. Ten years on from the collapse of Lehman Brothers, which marked the dawn of a financial calamity that shook the world, people across the UK are still dealing with the fallout of austerity. What continues to mystify me though, is the ongoing normalising of it. While food banks have mushroomed, local authorities stare down untenable budget shortages affecting crucial care for the most vulnerable, disabled people painstakingly try (as they have done from the very beginning) to expose the government’s culling of vital support services, and child poverty is rampant. Evidence of the kind of widespread fury and disgust needed to force a government to backtrack, simply isn’t there. Even when a landmark study in 2017 attributed 120,000 deaths to austerity it is still being pursued. Even as individuals, groups and grassroots organisations have mobilised to fight multiple aspects of the cuts, such as the Surrey families who recently took their local council to court to challenge the £21m to be drained from its special educational needs and disabilities budget, the cuts keep coming. Even as new books, such as The Violence of Austerity, edited by Vickie Cooper and David Whyte and to which I contributed, have come out and countless pieces of analysis have added to the wealth of evidence of the damage these policies have unleashed, austerity remains a fixture. At the recent Tory Party conference, Phillip Hammond the latest chancellor of the exchequer made it clear that more of the same was coming down the line. As many people, myself included, warned when the wheels of cuts began turning, a sort of perma-austerity has taken root. In a familiar political fear tactic, Hammond felt confident enough at the conference to declare that the Treasury’s austerity programme would prevail, using a swipe at the Labour leadership (“populists and demagogues”, apparently) to shore up his arguments. Labour, whose leadership in 2012/13 failed utterly to challenge austerity when it first took hold, were according to Hammond, now proffering “a discredited ideology that would never solve real world problems.” The hubris is staggering. Austerity is a discredited ideology. Austerity creates real world problems, not solve them. Just to put the cherry on the cake of facile contradictions, Theresa May, in a spectacularly dull speech, declared (as Osborne tried to 3 years ago) that austerity was actually over. It beggars belief. From the beginning, the advocates of austerity have tried to paint themselves as the responsible adults in the room. With metaphorical allusions to tightening belts, us all being in it together and balancing the books, they crafted a sneaky and incredibly effective narrative that framed cuts as a dose of medicine that had to be taken. All of this is nonsense. Austerity was never necessary. It was never a cure for economic crisis and poor policy decisions. And, May can say all she likes that its over – but the people affected know the truth. I’ve sat in the living rooms and communities of so many people whose lives, or loved ones’ lives, have been tragically altered by austerity it genuinely baffles me how Britain has put up with it, or the Tory framing of it, for so long. If there is ever going to be a tipping point it better be soon because, as we have seen, lives are at stake. Austerity Bites by Mary O’Hara can be purchased from the Policy Press website for £8.79. Remember that Policy Press newsletter subscribers receive a 35% discount – sign up here today. The views and opinions expressed on this blog site are solely those of the original blogpost authors and other contributors. These views and opinions do not necessarily represent those of the Policy Press and/or any/all contributors to this site. “Aristotle characterised the soul as ‘the essential what-ness’ of a living body. On this definition, and if we accept the university as a living body, the question of the soul of the university is a question about its essence. Universities are among the most durable institutions society ever invented. You can trace the idea of a university back to Greek philosophers, or Chinese sages, or Islamic madrassas. Even just its European manifestation goes back almost a thousand years. Somehow, despite their wide variety, there is something recognisable about a university. We feel that if a time machine dropped us into a university of say 500 years ago, we would recognise it, and not feel out of place there. Likewise, we hope that if the time machine brought us forward in time to the year 2500, we would still find universities recognisable, and flourishing. Such durability must be a consequence of the unchanging essence, the soul, of a university. And while we might dispute details and offer different formulations, there can be little doubt that the essence of a university has to do with the exercise of reason. Reason exercised, in particular, in the pursuit of knowledge and the search for truth. When we engage in learning and scholarship we do so in a certain way, and we try to inculcate that way in our students. We follow the way of rationality. This is not to say that universities do not adapt. They do. They may be maddeningly slow, and they may wander off into detours and dead ends, but they are not ignorant of what happens in society, because professors are people, and students even more so. So when we say there is something unchanging about the university – that there is an identifiable essence that characterises it – this is not an indictment of resistance to change. It is an affirmation of enduring value. Having said that, it must be recognised that at present universities are confronted with a societal change so fundamental it is hard to know how it will turn out. The very essence of a university, it seems, is under threat. Throughout the history of universities, the exercise of reason, the pursuit of knowledge and the search for truth have enjoyed the respect and support of society. But no longer. Or at least no longer to the extent to which universities have always taken such respect for granted. It is hard to think of any earlier time when the very concept of truth itself has been undermined and constrained as at present. Towards the end of 2016, the Oxford English Dictionary selected ‘post-truth’ as its word of the year. In a post-truth world, appearance matters more than reality, and what people can be led to believe takes precedence above what they ought to know. With hindsight we can see the signs. In the penultimate chapter of his 1997 book Truth: A History and a Guide for the Perplexed, the historian Felipe Fernández-Armesto traces what he calls ‘the death of conviction’, and the role of intellectuals in its demise. Deconstruction, postmodernism, relativism: the intellectual whiteanting of truth is well documented. Since the millennium, the decline of truth has accelerated. Iraq was invaded on the grounds of weapons of mass destruction, which were not found. The financial crisis of 2007–8 destroyed trust in the probity of banks and the veracity of governments. The widening inequality gap led to the rage of the Occupy movement. And, increasingly, a disenchanted electorate refused to vote as they were supposed to, turning to unexpected charismatics stronger on promise than on experience. In the UK, the leader of a political party signed a pledge, on camera, against any increase in student fees, and then, as part of a coalition government, voted to triple them. Another party elected as leader a man with no clear expertise but a messianic message, and although 80% of his parliamentary colleagues initially declared that they had no confidence in him, the electorate gave him an extra 30 seats in parliament. A former secretary of state for education declared that the people have had enough of experts. A new prime minister called a general election in the confident expectation of significantly increasing the government’s majority, and lost it. The United States of America elected as president a billionaire with no experience whatsoever of government, but an instinctive mastery of social media and an oceanic reservoir of self-belief as an exponent of the art of the deal. France swept aside both the established left and the established right, and elected a president who had never fought an election, and a party which had not existed a year before. Both the post-truth and isolationist developments are contrary to the idea of a university. Universities are where experts come from. The search for truth is what makes an expert. Truth knows no boundaries and no national identity. Universities, for hundreds of years, have welcomed anybody, regardless of national or cultural identity, who has the ability to contribute to, or the potential to benefit from, an environment concerned with knowledge and understanding. That is why universities have always been international entities, ever since medieval wandering scholars commuted between Bologna and Paris and Oxford. The post-truth conception of the world undermines the idea of a university, and the new isolationism constrains it. It may be argued that the current developments are just a new manifestation of the old tension between logic and rhetoric. But that would be to flatter the post-truth Twitterati. Socrates, Plato and Aristotle were all fairly scathing about the sophists, but they took rhetoric seriously, and no sophist would have openly flouted logic, though they were adept at twisting it. It used to be the case that public figures who contradicted themselves were held up to ridicule. Reductio ad absurdum has long been a powerful weapon for destroying the credibility of an opponent. But no longer. The Trumpeters have discovered that contradicting yourself is a way of validating any opinion. In the post-truth world of social media you can always refer back to the currently convenient half of your previous contradiction, and trust to the short attention span of your audience to forget the other half. Any thought of a response must begin with an admission. As academics, we have been complacent in watching the new posttruth spirit develop, complicit in facilitating it, and compliant in accommodating its consequences. Which is odd. How can we say that we strive for knowledge when we disdain truth? There are two key questions we should always ask about our academic work. The first is: what are we good at? The second is: what are we good for? The first question is about excellence: who is expert at what? The second question is about purpose: how do we respond to the needs and demands of society? Both questions are important and legitimate. We have been complicit in a relentless focus on the first question, and complacent in the face of a growing revolt about our lack of focus on the second. Inequality is about the distance between the haves and the have-nots. In the UK and the US the economic distance between the top and the bottom is greater now than it has ever been. This is worth taking note of, because there is a strong argument that social ills proliferate in direct correlation with economic inequality. The greater the distance between the rich and the poor, the more social problems the state will face. The same, I hold, is true for educational inequality. The UK and US like to boast about the world-class excellence of their top academics, counting their Nobel prizes like their Olympic gold medals. At the same time, just as the rich are stratospherically above the poor, and the super-athletes are on another plane than the obese masses, the star academics float above an underclass of barely literate and largely innumerate people who, we now know, are very angry. They have been fed a sugary diet of appearances rather than a healthy dose of truth, to the extent that they cannot recognise the difference any more. They do not understand the experts, nor do they interact with them. Whatever lingering vestiges of respect there might have been for clever people has been eroded by a lack of evidence that their work benefits everybody. There has not been a clear educational trickledown effect, just as there has not been an economic trickle-down effect. The knowledge gap, like the wealth gap, has become too large to endure. The central thesis of this book is that universities should pay attention to the question of what they are good for with the same rigour and determination as they pursue the question of what they are good at. This is not entirely a new idea. I quote a somewhat obscure medieval scholar called Boethius of Dacia as saying that the supreme good open to man is to know the true and pursue the good – and to take delight in both. You can read his own words on this topic in the Epilogue, and you can trace his idea back to Aristotle. We have not been paying sufficient attention to parity between the two guiding questions about the true and the good. We have self-indulgently been focusing on the former. Some have done so by undermining the very idea of truth. Among the remainder, who have no problem with truth, there is a school of thought that the search for truth is an end in itself – that advancing the frontiers of knowledge will suffice as a response to the question about societal benefit. We may call this the ‘invisible hand’ argument: that knowledge will always, in the fullness of time, through the workings of an invisible hand, bring benefit to society. Many of us accept this maxim as true, but some of us feel that it cannot be the whole truth. The pursuit of knowledge for its own sake is necessary, but not sufficient, for addressing the needs and demands of civil society. Its benefits are unpredictable in nature and slow in coming. In global society space has shrunk and time has accelerated to the extent that responsiveness to the challenges facing us cannot wait for the workings of the invisible hand in the knowledge economy. Universities need to engage with the challenges faced by civil society, global and local. We should do so with a proper understanding of when the pursuit of knowledge should be challenge-led rather than curiosity-driven, and how these two methodologies differ from and interact with each other. The societal benefit of having experts should be made manifest. We have not been clear about the feedback loop between excellence and relevance. In expounding my thesis, I have found it necessary to introduce some new ideas and debunk some common assumptions. ‘Applied research’, for example, is almost exactly what I am not talking about when I speak of ‘challenge-led research’. Applied research is a solution looking for a problem, challenge-led research is the opposite. I also have severe concerns about the fashionable idea of ‘merit’, and the accompanying socio-political construct of a meritocracy. A meritocracy, I argue, is much the same as an aristocracy, except that those at the top have higher self-esteem. Third, I am somewhat impatient with bogus quantification, and the deferential respect commonly paid to any conclusion arising from the application of a formula. We are prone to confusing accuracy of calculation with legitimacy of conclusion. This tendency is well illustrated by the current craze for university rankings. It takes only a little scrutiny to realise that these rankings are normative at least as much as they are substantive. They create a reality more than reflect a reality. Any competent arithmetician could easily find a perfectly plausible formula and a decent data set that will deliver pretty much any ranking you want. Rankings are a perfect manifestation of the post-truth society. They give the appearance of certainty and avoid the complexities of truth. In response to a question about quality they offer a single number, which is your university’s position on their ranking. And they get away with it, on the apparently unimpeachable grounds that the result was obtained by a mathematical calculation. Behind almost any discussion about universities is the question of quality. What makes a ‘good university’? This question, which occupies not only academics but millions of parents and prospective students, is of course only a proxy for a more fundamental question: what do we mean by ‘good’? Following Boethius of Dacia, I hold that ‘good’ has at least two dimensions: good as in excellent, and good as in virtuous. On the latter, less explored axis, quality is inseparable from equality. Likewise, equality is inseparable from diversity, which leads me to conclude that quality needs diversity. I have now said what my book is for. If you ask, on the other hand, what my book is against, it is the poverty of linearism. ‘Linear’ just means ‘as if on a straight line’, which is how ordinary numbers are arranged. A straight line is the simplest representation of one-dimensionality. When we assign everything a number we have enforced a situation where, of any two things, one of them has a higher number than the other, and so is presumed to be better. Linearism, then, is a lazy preference for the apparent certainty of one dimension rather than the multidimensional complexities of truth. A ranking, of universities or anything else, is a numbered list, which is a one-dimensional representation of whatever reality we started with. The problem is not that it is done, but that it is so easily and uncritically accepted as a true representation of reality, rather than a preferential ordering. I can easily rank apples above oranges; that will tell you something about my preferences but nothing about fruit. The antidote to one-dimensionality is more dimensions. I advocate an academic landscape, the two axes of which are excellence and purpose. The excellence axis is our response to the question of what we are good at; the axis of societal purpose is our response to the question of what we are good for. As in any landscape, the two axes are conveniently thought of as being orthogonal: at right angles to each other. Such a conceptualisation is half metaphorical and half practical. Metaphorically, I argue, we should envisage the good as orthogonal to the true. In practical terms, what this means is that challenge-led research cuts across disciplinary research (for which we use words like ‘cross-disciplinary’), and the idea of knowledge in service of society cuts across the idea of knowledge for its own sake. One advantage of the landscape metaphor is that we are not trapped by another common assumption, which is that academic debate presents itself as a series of binary oppositions. It is not the case that we are talking of excellence versus purpose; the good versus the true. Instead, we can talk of excellence and purpose, knowing the true and pursuing the good. We can delight in both, because each can reinforce the other. On the metaphor of an academic landscape each university could determine for itself its desired coordinates. What subjects do you wish to be good at? And what contribution do you wish to make to the challenges facing civil society? Given your circumstances, location, history, opportunities and responsibilities, where would you like to be located on the axis of excellence, and where on the axis of societal relevance? And how do these two ambitions interact, and mutually reinforce each other? In the same way as we all strive to be a ‘world-class’ university on the axis of excellence, we can all strive to be a ‘civic’ university on the axis of societal purpose. ‘Civic’ is nicely ambiguous: it can refer to your interaction with your city or region, but it can also refer to your responsibility to civil society – local, national or global. Just as a world-class university knows what it is good at, and has the evidence to back it up, a civic university is one that knows what it is good for, and has the evidence to back it up. For better or for worse, the good-at axis has developed as a competitive one – a fact the rankers have clearly perceived and ruthlessly exploited. The good-for axis, however, is intrinsically a collaborative one. Tackling climate change, or clean energy, or antimicrobial resistance, or obesity, or inequality, or extremism, or any other grand challenge facing global society, is unlikely to be the work of some lone genius. It will be the work of committed teams with various forms of expertise, interacting on different fronts. Locating ourselves on an academic landscape means we can compete when competition will suffice and collaborate where joint action is necessary. And so, in summary, this book is one of advocacy. It is a set of academic considerations regarding the soul of a university. In a post-truth society we need to keep up the search for truth and understanding, but we need to do so with a better understanding of why we are doing it, and a clear commitment that academic excellence must respond to the challenges facing civil society. In an increasingly fractured world, we need to combat isolationism with the simple truth that your problem will no longer stop at my border, nor mine at yours. It is up to us to demonstrate that the world can still benefit from wandering scholars. The soul of a university by Chris Brink is available with 20% discount on the Policy Press website. Order here for £11.99. Bryn Jones and Mike O’Donnell, editors of Alternatives to neoliberalism, examine the problems of authoritarian nationalism and explain that the best hope for greater equality and quality of life lies with people themselves, and in more, not less democracy. The paperback of Alternatives to neoliberalism is out now. “When the hardback edition of our co-edited book was published in early 2017, it was the long, harsh aftermath of the 2007-8 financial crisis and subsequent recession – encapsulated in the term ‘austerity’ – that we challenged and sought answers to. Along with a growing number of progressive critics and politicians, we named the extreme free-market ideology of neoliberalism as the underlying cause of the economic and social disruption that still persists. Alternatives to neoliberalism offers a range of democratic and egalitarian alternatives from progressive academics and policy practitioners. Their answers apply now even more urgently and provide a concrete vision of a participative society in which power is exercised by citizens, routinely in the communities and institutions in which they engage, and through robust systems of accountability at regional and national levels. However, the current resurgence of authoritarianism in many parts of the world, notably in the United States, Eastern Europe and Russia, and the Philippines, is not significantly the product of theoretical thinking – rather the opposite. Liberal capitalist regimes, especially neoliberal ones, tend to respond to economic crisis and the social protest it provokes, with a shift to authoritarianism. Thus, they impose austerity on the majority in order to pay off debts caused mainly by financial speculation. The cry ‘we are all in this together’ rings out and populist nationalism is offered as the antidote to ‘the peoples’ complaints. In reality, political turbulence following economic chaos serves to obscure the real causes of crisis and misleads popular opinion. ‘Taking back control’ in terms of sustained democratic participation is a fair description of what is least likely to happen. Alternatives to neoliberalism seeks to make these processes transparent and to offer solutions. Authoritarian nationalism typically couches the promise of restoring economic prosperity in terms of cultural inclusion and exclusion. These two aspects are rhetorically conflated as populist leaders and supportive media frame ‘the solution’ in terms of a supposed long-suffering national majority and ‘others’, frequently recent migrants or more established but easily differentiated and scapegoated groups. This was the scenario in inter-war Germany and is currently being played out in numerous parts of the world, if for now in somewhat less brutal terms. Why ‘we’ behave in this way is not best explained in terms of the psychopathology of the few – although that has some traction – than in the exploitation of insecurity and want. It need not be so. The message of our book is fundamentally optimistic. Sceptical of the sustained intentions of remote elites to deliver on electoral promises, we believe that the best hope for greater equality and quality of life lies with people themselves, in more, not less democracy. However, we mean this not in terms of current populist bombast but in the extension of citizens’ engagement and rights. Thomas Marshall’s classic book on citizenship published in 1950 chronicles the development of a trilogy citizen’s rights in Britain; civil (legal), political and social. We advocate a fourth phase in the accretion of citizen’s rights: the development and implementation of democratic participation and accountability from the bottom to the top of society. Already many community and voluntary organisations as well as more formal organisations such as trade unions and small businesses contribute to sustain their localities. Anna Coote, a contributor to the book, argues for a ‘new social settlement’ that would channel capital and resources ‘upstream’ drawing on civic organisation and vitality, leaving to residents more control of expenditure and development be it, for instance, in social care, additional educational and leisure facilities, community enterprise, and the maintenance and protection of the environment. A complementary policy presented in the book would require supermarkets to negotiate and contract for the provision of certain services such as sourcing a minimum quota of local produce and/or meeting enhanced environmental standards. Building a more participative society will take organisation. Like any major change it has a political as well as a socio-economic dimension. It requires a redistribution of power. An increase in democratic participation in locally based institutions of, for instance, big business, education and in budget allocation will cumulatively have major regional and national implications. If sustained it will create a participative democratic society. Such redistribution of power as we are currently seeing is into the hands of populist politicians. After the virulently totalitarian inter-war bout of authoritarianism and the war required to defeat it, there was a widespread desire for social reform. That reform, Marshall’s third phase of citizens’ rights, has been pushed back and as a priority must be defended and re-established. But beyond necessity awaits the tantalising possibility of a society of meaningful participation and opportunity. Alternatives to neoliberalism edited by Bryn Jones and Mike O’Donnell is available with 20% discount on the Policy Press website. Order here for £20.79.